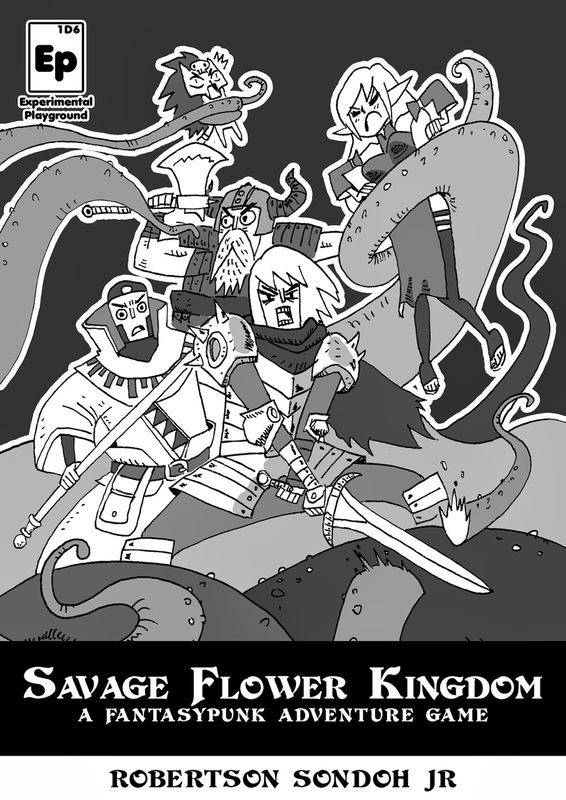 Welcome to the world of Savage Flower Kingdom – where everything will try killing you for fun or dessert. Nevertheless, it is a strange, mystical and adventurous Kingdom with a lot of hidden treasures. Let’s go to adventure! Designer's Note: A new version needs a new cover and a new post! Enjoy the new Savage Flower Kingdom! I just wanted to point out that I think I saw a few typos after printing it out. Never the less - I believe it's nevertheless as I don't think I've ever seen it spelled out like that. Add some colons ':' to go after the name of each class. So, 'Elf: Starts with 1d6...' instead of, 'Elf starts with...' And also maybe label 'Wizard' as 'Wizard/Witch'? Maybe instead of, '... or any magical means.' You could say, '...any magical items or spells' (or items/spells). ---Ex: I roll a 2 with the maid and she drops the sandwich on the ground getting dirt and bugs on it. --Shield: Maybe call it a 'Barrier' instead to denote an in-game difference between a magical one and a physical one. --Chef: I think the Maid should get this skill and Make a Sandwich for free but be disallowed from picking skills until the character is leveled up some. --*Locksmith: Should read as, '+1 to a Physical roll...,' and not '+1 to Physical. --*Strong: Same as '*Negotiator.' remove 'Physical' and replace with 'any'. To be clear, if I roll a 12 to the TN's 9, I don't get any damage and when I fumble I need a stretcher? And by halving the GM's damage in the fall, you basically mean not getting hurt toooo badly right? Also, write, '... ability against the TN (usually 9) set by GM to halve the damage'. Next part, 'When your turn arrives, you can pick one of the options below:'. --Other Action: Maybe rewrite as, 'This is for actions surrounding picking locks, reloading a bow/crossbow, opening a window, using an item, etc. I noticed that you mentioned somewhere that you might be working on expansion. Whatever you add, I hope you add a minor section for magical items/weapons/armor/etc. Lastly, maybe indent each monster's ability? I really hope all of that was helpful! I love your artwork in all of your games as well as enjoy playing them and look forward to more of Savage Flower Kingdom!! One last thing, it's a lot easier to reach me at the BGG if you want to get back to me on the above. Again, I am Aniketos =) ... Sadly, due to school and RL issues, it has been a while since I last played one of your games =( I hope to print out and play some more in 2014! Hi Aniketos, I am registering SFK in RPGeek now. Also, thank you for fixing my typos. I really really appreciate it! I will fix the PDF later and post it. Do feel free to suggest more content for SFK and/or our other games! or better yet suggest a new game! So there's this usual problem with the SFK series. Or at least, something I see as a big problem. 1 HP/MP costs 1 XP. 1 spell/skill costs 3 XP. 1 ability point costs 5 XP. 1d6 gives a mean of 3.5. Now, a starting Wizard is worth (3.5+8+8)x1 for HP/MP, plus 8x5 for CP, plus 3x3 for spells, which is a total of 68.5. Dwarf: (3.5+14)x1 for HP/MP, plus 7x5 for CP, plus 3 for Goblin Rage, which is a total of 55.5. Elf: (3.5+10+6)x1 for HP/MP, plus 7x5 for CP, plus 2x3 for spells, which is a total of 60.5. Priest: (3.5+10+6)x1 for HP/MP, plus 8x5 for CP, plus 3x3 for prayers, which is a total of 65.5. Since between the classes there aren't any other differences, seems advantageous to start as a Wizard rather than a Dwarf because in the future you will be able to emulate the Dwarf by using the XP. I don't know if this was intentional or not. 1) balance the XP worth of classes (mayge give more CP to classes like the warrior, still in a maximum of 3...). 2) give level ups instead of XP buying system. Do a level up table like other RPGs. - Cleric gets full MP at midday/midnight. Normal ways for restoring MP don't work for him because it's MP for prayers, not spells. Tax 15% XP. *Or anyone can? By the way: maybe if a non caster ever earns MP, he can choose to buy spells/prayers, then if he gains a single spells he may never get prayers, and viceversa. Thats because the MP fpr spells and for prayers are different things. One who casts spells, if he wants prayers too, he must buy different kind of MP. Thanks for the suggestion and telling the problem of SFK. Those words prove to be valuable to me and improve on the next SFK. Thanks again! Bem Vindo ao mundo de Savage Flower Kingdom- Aonde qualquer coisa irá tentar matar você para se divertir ou pra sobremesa. Mas além disso, é um lugar estranho, místico e um reino de aventuras com vários tesouros ocultos e mistérios. Vamos nos aventurar! 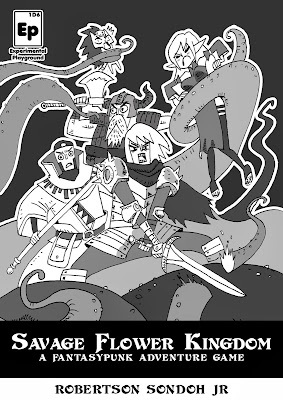 Welcome to the world of Savage Flower Kingdom – where everything will try to kill you for dessert or for fun. Nevertheless, it is a strange, mystical and adventurous kingdom with a lot of hidden treasures and mysteries. Let’s go to adventure! My translate project for Portuguese (Brazilian) of Savage Flower Kingdom. Hello, I just wanted to point out that the links to the "Savage Flower Kingdom Bestiary (French)" is probably wrong, because it goes to the same file than the "Savage Flower Kingdom v2 (French)". Do you have any link to this "french bestiary"?